Jenny Clapson with a young visitor in her studio. 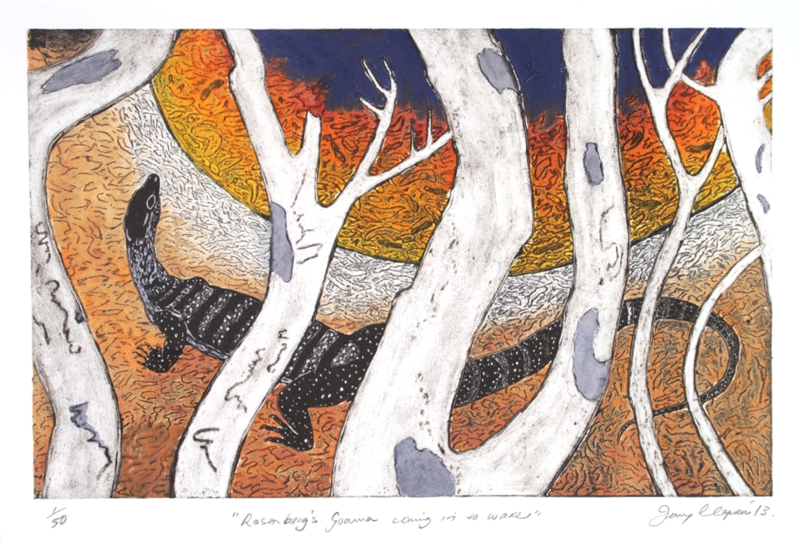 With more than forty years experience as a professional painter and printmaker it is no surprise Jenny has risen to national attention, with her works held in the National Gallery of Australia. Jenny Clapson was born in Broken Hill, but for most islanders, it is hard to remember a time when she was not a part of the local community, and shining bright in the world of Art. Shining started early for Jenny. She graduated from the South Australia School of Art winning the John Christie Wright memorial Prize for Life Drawing and Painting. Jenny has worked professionally from Kangaroo Island for more than four decades. She has exhibited in Galleries across Australia and overseas, and is respected throughout the wider Arts community for her skills in a variety of mediums including oil, watercolour, gouache, acrylic and photopolymer etching and monotypes. She creates these on her beloved hand press in her farmhouse studio. Jenny Clapson’s work is deeply inspired by the experience of living a rural coastal lifestyle with her husband on the family farm, just a stone’s throw from the beach. Much of her work is derived from these glimpses of her own very personal Kangaroo Island experience. Her deeply emotive visual language has grown from living so close to the natural world and in the life she shares with people and events in the wider island community. Drawing upon the island’s “isolation, strong sense of community, geography, wealth and proximity of its wildlife”, Jenny captures KI life in her art. Jenny has always been passionate about nurturing creativity in young people, on Kangaroo Island and beyond. She has taught sessions in local schools, encouraged students to participate in community arts workshops and events. In 1986 she was appointed to lead a state wide community arts project, mentoring groups from communities across South Australia to create a series of huge banners. The Dragons and Demons banners was a massive project designed and directed by Jenny, made by the community and based at the Festival Artspace. They were part of the parade in the Opening Ceremony of the Adelaide Festival of the Arts and were later hired out to Festivals across Australia. Jenny’s work has enduring quality and great integrity and is held in high regard, included in the collections of ArtBank, Art Gallery of South Australia and The National Gallery of Australia. Meet Jenny in person when she joins us as Artist in Residence between 11 am and 2 pm Wednesday April 19th.